"If you don't bring this man back, I'll find ya and put you in the ground." 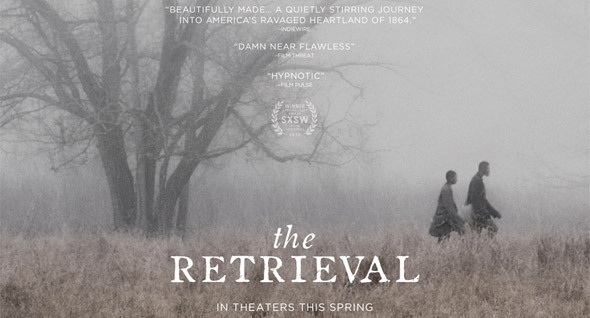 Today's indie trailer is for a Civil War dramatic thriller titled The Retrieval, which won a Breakthrough Performance Award at SXSW 2013. Ashton Sanders plays a boy assigned by a bounty hunter gang to retrieve a wanted freedman, played by Tishuan Scott, and bring him back to the South. The two begin to form a bond and things get complicated. The cast includes Keston John, Bill Oberst Jr and Christine Horn. I'm not sure how we just found this film now, but it looks fantastic - stunning cinematography, powerful story, heart-wrenching performances. Wow. On the outskirts of the Civil War, a boy (Ashton Sanders) is sent by a bounty hunter gang to retrieve a wanted freedman and bring him back to the South, but as they begin to form an unexpected bond, the boy must face a gut-wrenching decision. The Retrieval is directed by American filmmaker Chris Eska, of the film August Evening previously, which won him an Indie Spirit award. His latest film first premiered at the Ashland, Phoenix & SXSW Film Festivals last year. It has won numerous awards at various fests: Audience Award in Mill Valley, Best Film at Ashland, and a few rave reviews - more on their official website. Variance Films will be releasing Chris Eska's The Retrieval in limited theaters starting April 2nd, 2014 this spring. Thanks to Apple for debuting this trailer in high definition. Another good indie film to take a closer look at. Too much info in the trailer! Alex, thank you for posting The Retrieval trailer. I'm proud to be a part of Chris Eska's film; one of those rare ones that actually mean something and that reach out to what makes us alike, rather than one makes us different.